I'm installing three-way components in my Model 3: 1.5" tweeters, 3.5" mids, and 6.5" woofers. I'm not bothering to replace the rear speakers; I'm going to tune their overall amplitude down so that they'll only be audible to people in the rear seats. Interestingly, the new Focal Utopia M series offers a fourth component, an 8" woofer. The front doors in the Model 3 might actually have room for that, but I'm not a bass junkie so that would be overkill for me. 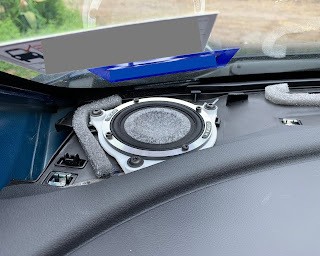 So I'm installing six speakers into the stock locations, I'm disconnecting the center mid and tweeter, and I'm disabling the overhead imaging tweeters. The OEM tweeters are installed in pods on the front edge of the front doors, just behind/underneath the A pillars. The OEM tweeters are about one inch in diameter, pretty standard. I tried to mount my aftermarket tweeters inside the OEM pods, but the massive Focal Utopia M tweeters just don't fit. Over the course of several months, I prototyped a series of custom enclosures to hold the Focal tweeters. The final product looks almost identical to the OEM housing, the only difference being that it extends about 1.5 inches farther backward to accommodate the larger tweeter. The OEM tweeter assembly has three parts. There's the tweeter itself, a plastic frame that holds the tweeter and clips it to the door, and a plastic cover wrapped in acoustically transparent black cloth. I decided the easiest thing to do would be to discard the OEM cover, cut the OEM frame to accommodate the Focal tweeter, and design/print a new cover to look just like the OEM assembly. It took fourteen iterations to get everything just right. and glue that onto the OEM frame. The end result is a very clean product, almost identical to the original. At this point I'm almost but not quite done. And that's because I only have the left tweeter assembled and installed. I cut up my original OEM frames for the prototyping process and I ordered new tweeter assemblies from Tesla ($30/each) about three months ago. The left assembly was delivered a few weeks ago, but I'm still waiting on the right side. From what I read about other people's experiences buying repair parts from Tesla, a three month wait is about average. When/if I receive the right side assembly, I can cut that up, glue the aftermarket tweeter in place, and pop it into the car. I replaced the two 3.5-inch mid-range speakers in the front dash with two Utopia M 3.5-inch speakers. This was pretty trivial. I just printed some adapters that connected the Focal speakers to the OEM mounting holes. No surprises. There's more than enough room inside the front doors to accommodate the Utopia M 6.5" woofers (probably enough for those 8" woofers as well), but the geometry is sufficiently complex that I had to design the parts using trial and error. I made an adapter that mounts the Focal speaker to the OEM location, and this time it only took three tries to get it right. I was also concerned about water. Every time I've opened up the doors, there's water inside. Just a few drops, and the OEM speakers seem to handle it just fine, but I'd like to keep my new speakers dry if I can. I added another piece to partially cover the back of the speaker. It can't fully enclose the woofer of course, that would ruin the frequency response, but an arrangement of angled slats work like shingles on a roof to keep water off the speaker. Another quick note, I used duct tape to make gaskets on both mounting faces on the adapter. Those provide good seals between the speaker and the door. As always, parts I designed are posted on GrabCAD.